Shrinking the iconic team down, many of the Funko X-Men Mystery Minis figures mimic their larger Pop! options. The set features several original Marvel X-Men characters. Most people are familiar with the famed mutants, partially due to the mega-blockbuster X-Men film franchise. However, the team of superheroes began as a small group (five to be exact) in the first issue of Marvel Comics' The X-Men in 1963. Co-writers Stan Lee and Jack Kirby created the new group born with natural superpowers with Kirby drawing the Marvel-defining characters. Founding members Beast and Cyclops can be found, along with Professor X and Magneto, who made their debut in the first issue, too. Although not introduced until the '70s, Colossus, Storm, and Wolverine are also included. In addition, there is a Logan mini featuring Wolverine in his everyday attire. 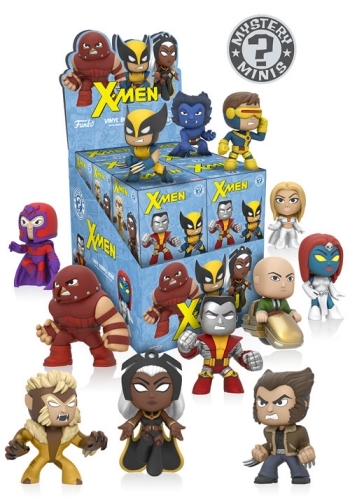 Because the Funko X-Men Mystery Minis figures are issued in a blind-box format, each of the boxes is packaged to look and feel the same to keep the contents a true surprise. With no announcement for any exclusives, there appear to be just 12 minis, making it fairly easy to collect the entire set. However, with a dozen figures per case, more than one case might be necessary to find them all if they have varying rarity. The specific odds are currently unknown for the 2 1/2" tall Funko X-Men Mystery Minis, but we will update as details emerge. Funko Pop X-Men Mystery Mini Series! 1 Case of 12 factory sealed NEW!! !